Sapa is one of the most interesting sightseeing in the north of Vietnam, with the height around 1500-1650 m above sea level. Sapa is a land of modest, quietly but hides varies wonderful of natural scenes and Sapa is also a nest of hill tribe as: Black H’Mong, Red Dzao, Xa Pho, Tay, Zay…etc. The tourist come to sapa not only to enjoy the fresh air, the peace of the Northwest region but also it’s a destination that it give you a chance to admire the wild beauty of the rice terraces, waterfalls water, majestic peaks fun, exploring the traditions, the cultural beauty of the mountain peoples such as black H’Mong, red Dzao, Tay, Dzay …. With the famous of the Fansipan mountain at 3.143 m on the Hoang Lien Son range. Hoang Lien Son forest is also very rich with animals and plants. There are more than 136 species of birds, 56 species of mammals, 553 species of insects. It has 37 mammal species recorded in the “Red Book of Vietnam. Hoang Lien Son has 864 forest plant species, including 173 species of medicinal plants. 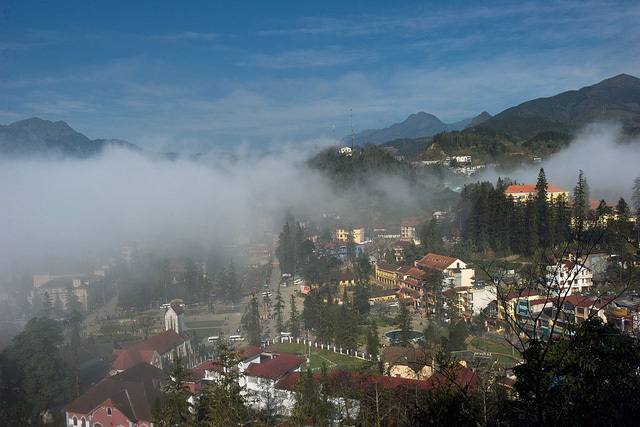 Ham Rong mountain is laid on Sapa Town and tourist can climb up to enjoy the view of all the town, Muong Hoa Valley, Fansipang peak and many small village nearby. 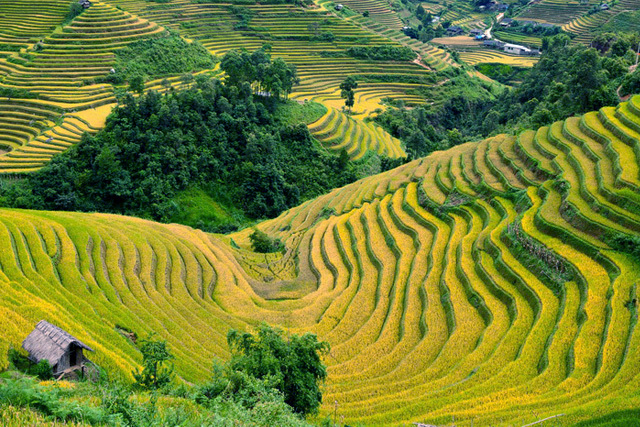 Now Ham Rong is embellished by mankind, it is indeed fruitful landscape of Sapa. And if someone have been to Thach Lam ( Van Nam – China) it seems that here is the second Thach Lam. There is a stone church in Sapa town and from the town and go back to the North East on the road to the Ta Phin cave, there is a Monastery near the hill side here that is built almost by stone. Ta Phin Cave is big enough to cover a military regiment. The cave is beautiful with many shapes like the first dance, the delegation seated, meadows, woods sparkle. Especially, there are 196 islands strange shapes carved by the ancient inhabitants thousands of years ago on Muong Hoa Valley that archaeologists still did not have the decipher. This area antique engravings rated a National monument. There are 6 ethnic people live in Sap, each of them have their own distinct cultural capital with festivals, such as: “POC forests Festival” of Zay, San span” (mountain bike) of H’ Mong, ceremony “year dance” of the Red Dzao. All festival take place on Lunal New Year. Sapa is the “kingdom” of fruit, such as peach blossom, peach to yellow, small yellow peach, plum queen, purple plum, plum flowers, lay single, flowering plum, flowering pear, peach blossoms, chrysanthemums, roses … especially the immortal flower live forever with time. There are many special markets making by minority people in Sapa as well as the area nearby in a week such as: Bac Ha Market on sunday, Can Cau market on Saturday, Cocly market on Tuesday, Cao Son market on Wednesday, Lung Khau Nhin market on thursday, Muong Khuong market and Muong Hum market on Sunday..etc. And on every saturday evening, a market is took place in Sapa Town, it makes by the boys and girls Hmong, Dzao people, by the sound of the Forum, the flute, praise Mongolia, with a bowl full of wine people age … and they have set for it is “love market”. It’s wonderful if you have a chance to discover the landscapes in this mountainous area. 12 km of trekking, visit Y Linh Ho and Lao Chai villages of the H’mong minority. after lunch at a local family in Lao Chai or in a drinking shop nearby the river bank, we keep on hiking to Ta Van village of the Dzay where we stay overnight in a local family. Here you have opportunity to experience their daily life, work and original custom. Home-stay at the Dzay local house. What do you think of Sapa Treking (2Days - 3Nights Sleep Home Stay)?